Lee Daniels spoke out about the alleged racial, homophobic attack on Empire star Jussie Smollet that occurred early Tuesday in Chicago. Smollett, 36, had arrived in Chicago Monday night. He was on his way to get something to eat at 2 a.m. when he was allegedly attacked. 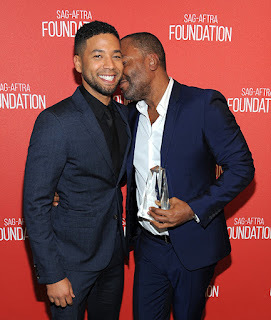 Sources tell WENN.com two masked men recognized Smollett from his role as openly homosexual singer/songwriter Jamal Lyon on Empire , and shouted, "Aren't you that f**got Empire n**ger?" Police claim the suspects began beating Smollett and poured bleach on him, before tying a rope as a noose around his neck. Smollett drove himself to the hospital. He was discharged in "good condition" after receiving treatment for minor injuries including a cracked rib. "It's taken me a minute to come to social media about this because, Jussie, you are my son," an emotional Daniels said in a video on his Instagram page on Tuesday. "We got this @jussiesmollett," alongside a rainbow flag and two Black power symbols. Daniels added: "You didn't deserve - nor anybody deserves - to have a noose put around your neck; to have bleach thrown on you; to be called 'die fa--ot, ni--a,' or whatever they said to you. We are better than that. You are better than that. America is better than that. It starts at home." Smollett, 36, is in Chicago to film the upcoming season of Empire . Daniels is the creator and director of the scripted TV series.